This amazing peace mantra is taken from Brihadaranyaka Upanishad. Moreover, it is considered that the chanting of these verses bring peace. 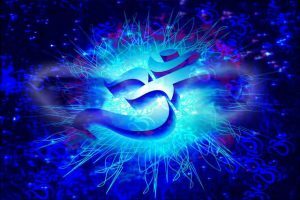 Mantras are sacred ancient sounds – vehicles for transformation which have been chanted and meditated on by yogis since primordial times. Furthermore, it is said that sacred mantras were first experienced by sages and yogis as spontaneous sounds heard during deep meditation state. Shanti mantra or peace Mantra are Sanskrit stanzas which if chanted daily with a pure heart brings peace and prosperity at different levels. Even listening to these healing sounds regularly brings wellness and peace into the heart of practitioner. Each Sanskrit mantra is followed by the word peace (Shanti) 3 times, signifying peace at 3 different levels i.e, aadhyaatmika, is the peace at physical and mental level; peace or peace with 5 elements – fire, water, earth, air and ether; and aadhidaivika, which is peace with God to defend us from fury of God and nature. More importantly, practicing these sacred sounds of power 108 times before sunrise purifies the body and mind, resonate with energies inside and can change how we experience ourselves and the world, and lastly, it brings us closer to our true divine nature. This entry was posted in Sanskrit Mantras on February 27, 2016 by admin.